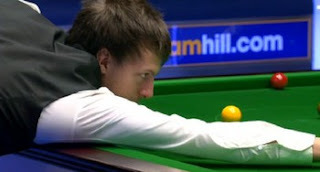 Judd Trump set up a meeting with Ronnie O'Sullivan in the last 16 of UK Championship after beating Dominic Dale 6-4. The Crucible finalist took the opener with 56 before Dale levelled with 118. The two players got alternate frames to go 2-2 before mid session. After mid session, The Spaceman was in command of the match, winning two frames to lead Trump by 4-2. 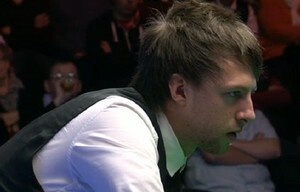 The match is turned-on after Trump getting three flukes in frame seven that helped frustrating Trump to level 4-4. Trump later found his mood to beat Dale by 6-4 from 2-4 down with a few half centuries. Trump set up a clash with O'Sullivan in last 16. The Pistol Mark Allen who recently came out from the shadow of depression earned a 6-3 victory over Adrian Gunnell. Allen knocked good breaks in the match, had a run of 91, 77, 73, 68 and 56 to make his meeting against Ali Carter in the next round certain. The former world number one, currently the world number two Mark Williams survived a test from Joe Jogia, winning 6-4 despite leading 2-4. "I should have won a lot more easily, and in the end I was glad to get over the line," said Williams. "I played well early on, then my legs fell off in the middle of the match. If Joe hadn't miscued on that black, it could have been worse for me.'' Williams said. Williams now faces Ricky Walden, who recently produced his first maximum break last week on PTC 10 that beaten seeded Stephen Lee by 6-3. "I'm very pleased, I played well in patches," said former Shanghai Masters champion Walden, who figured briefly among the top 16 last season. "I fell as if I can grow into the tournament and play better.